I've decided to call this a guide rather than a tutorial, because although I will be showing you how to make one simple whimsy, I'm trying to provide number of variations and options, so that it is a more flexible and adaptable. Our whimsy is made up of three parts: the veil, the main decoration, and the secondary decorations (optional). I'm going to take you through making a ribbon bow for the main decoration, and using chenille pompoms as the secondary decorations. The main body of our whimsy is the veil. 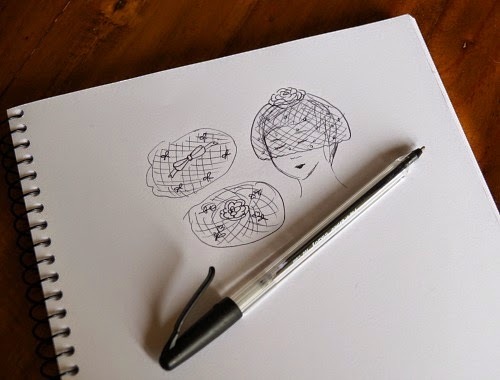 The picture below shows the kind of veil I'm working with, and here in Australia it's the easiest to find. You can often find it at Spotlight, if your local shop has some millinery supplies (sometimes only temporarily during racing season). 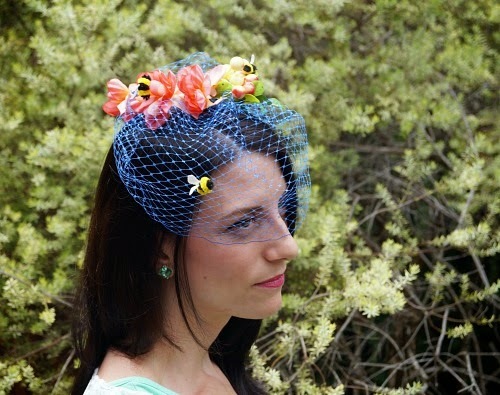 For a bigger range, some Aussie millinery supply places are Torb & Reiner, House of Adorn, and Hatters Millinery Supplies. The only overseas supplier I have ordered from is Judith M in the USA, so that's the only one I feel comfortable recommending specifically, but I'm sure many others are excellent. 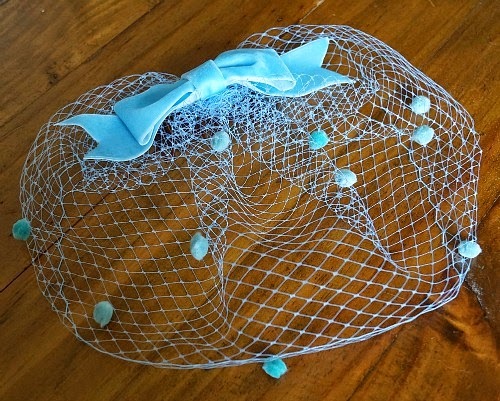 Other styles of veiling are fine too, whatever you like best! 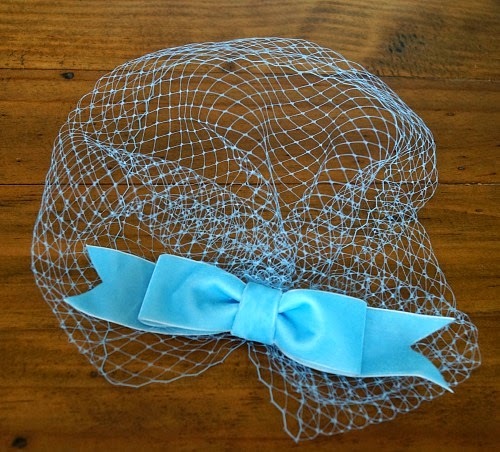 If you can find vintage, the range of veiling types is much broader. They also come in different widths. Mine here is 9 inches wide, which ends up falling to my nose. I'm using a length of about 75 cm (29.5"). 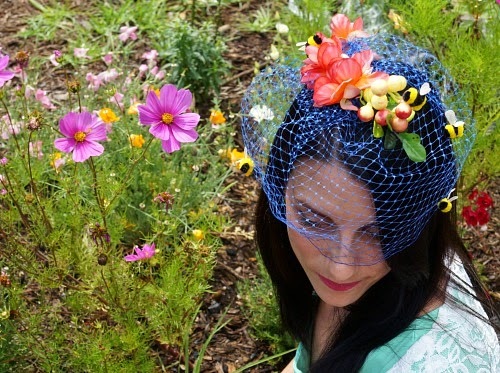 "Hats on Heads: The Art of Creative Millinery" by Mildred Anlezark recommends 1 yard (91cm) . You can get a tape measure and play with lengths around your own face and see what you think will work. I'm going to be gathering it up at the back, so keep in mind that doing so will require extra length. Gathering at the back is a nice look, and saves having to worry about a neat join. Cut your veiling length and trim to the diamond points (that's what I'm calling the little rectangles where the diamonds join in the veiling). 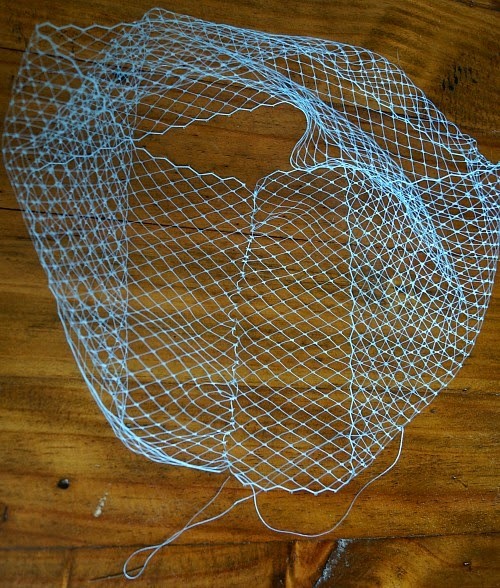 We are going to join the two short (cut) ends of the veiling piece together. 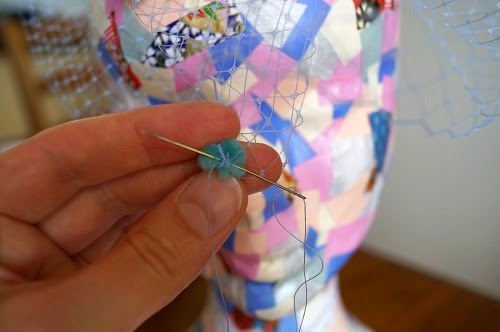 Thread a needle with a length of thread and knot the end. Thread through one of the diamond joins, at the bottom of one edge. Make sure it is secure and knot more if needed. Line up your two veil ends. 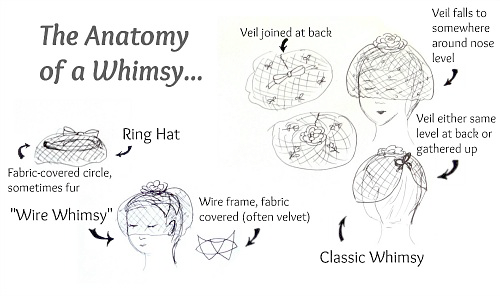 Sew through the diamond points, catching them from each veil edge alternately. Continue stitching around the top edge of the veil. Weave the needle through the top row of diamonds. You can also catch occasional diamond points if you like. When you have reached the back seam again, gently pull your thread to gather the veil. Adjust the gathering with your fingers to help it along. You should now have your basic whimsy crown shape. Tie off the thread in a secure knot. I'm using a 4cm (1.5") wide velvet ribbon. I like the look of bows with wider ribbon, but use whatever you have. 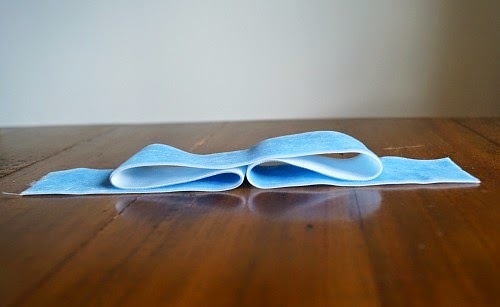 For this ribbon I have cut a longer piece at 47 cm (18.5") long and a shorter piece (the centre piece) at 10 cm (4") long. Thread a needle and knot the end. Fold your bow as shown. 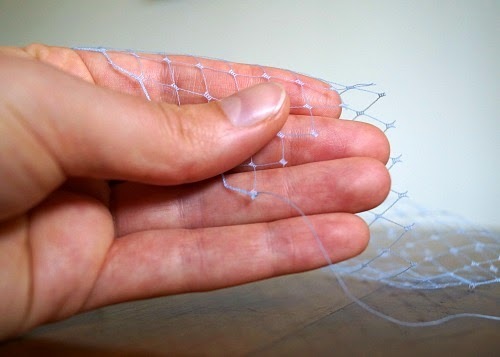 Tie a few stitches to hold it in this shape. Gather the centre of the bow a little. You can do this with a little gathering stitch or by just pinching the centre up with your fingers and sewing it in place. We aren't getting a total gather here, just a bit of shape. Take your bow centre piece. Fold the long edges under if it is too wide (as mine is). 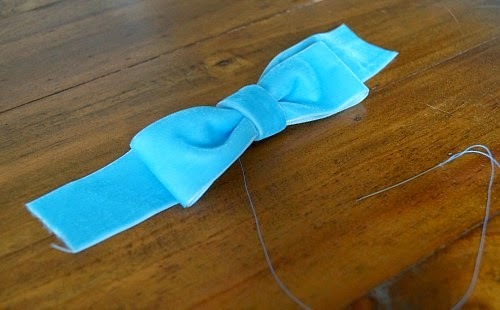 Wrap it around the centre of your bow, and stitch in place at the back. 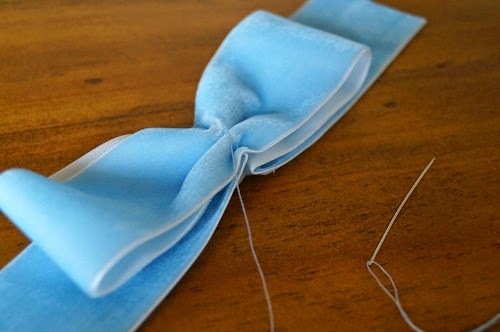 Trim the ends of the ribbon into a diagonal or v-shape. Now stitch the bow to the veil, covering the bunchy gathered centre. I'm using little chenille pompoms, because they are very easy, and also because I bought two massive mixed packs of them when I was getting materials for the Bumblebee whimsy. These packs cost about $8 (I think, I got them on sale at $4), from Spotlight. The pompoms are pretty easy to buy from craft shops and online, where you can also get just one colour. Variations for the secondary decorations are vast. 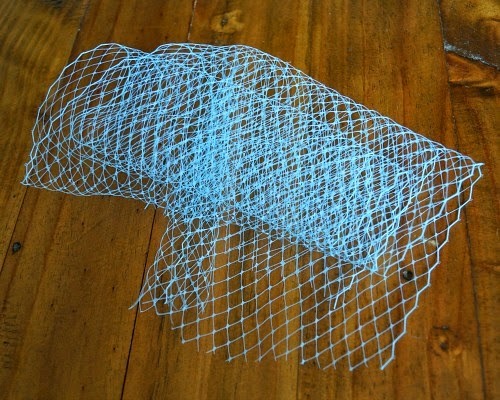 Anything you can sew or glue onto veiling! Consider the weight, though, because anything too heavy will change the way the whimsy falls. If it looks weighed down, you lose the light, floaty appearance that is so charming. Consider small beads, rhinestones, buttons, tiny flowers or smaller ribbon bows. If you are a crafter, you probably, like me, have boxes of miscellaneous bits that are bound to turn up something good! Where it isn't ridiculously tedious or impossible, I recommend sewing on decorations like this, because the glue will show through on the inside of the whimsy. Honestly that wouldn't bother me personally, but sewing is certainly a more professional look. Thread your needle and knot the end. Go through the chenille pompom first, because it will hide the knot in its fluff. Then through a diamond point, stitch a few times, and tie off. Repeat for each pompom. Consider the placement of the decorations. You might want to put the whimsy on and work it out in the mirror, or use a foam head if you have one. You probably don't want anything blocking your eyes or sitting right on the centre of your nose or something. 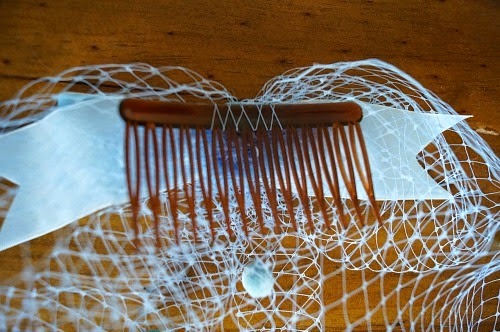 To make your whimsy ready to wear, sew on a comb. I've used a plastic one here to demonstrate, because they are so easy to find, but there are also metal combs available. Any style of clip is fine, if you have something you prefer wearing. 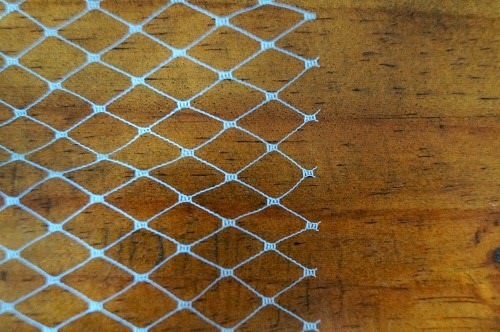 If using a comb, I like to run my stitches in a regular pattern like this. It makes me feel neat, which doesn't happen often. Your whimsy is complete. Wear it with joy! Also: Bonita has shared a fabulous tutorial for making a floral corsage brooch. I think the felt flowers and felt bow would also be a wonderful way to decorate a whimsy, if you are looking for some other creative options! Please share anything you make with me. I'd love to see your creations! 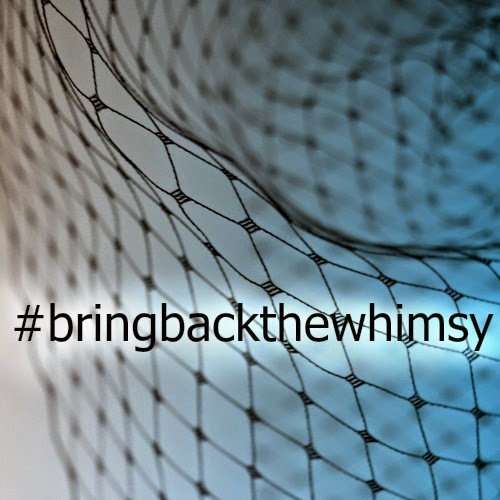 Don't forget to use the #bringbackthewhimsy hashtag on social media. And please just ask in the comments if you have any questions. Our travelling hat, Adelaide, has been visiting Miss Beta in Portugal! She has now been to as many countries as I have! Oh dear. 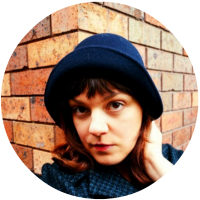 I have been lucky to get to know many many lovely people in the vintage blogging world, and Beta is one of the loveliest. She always has a kind word of friendship and support to offer. Beta has styled Adelaide with a Japanese vintage dress. I love the way the warm colours in the dress pair with the black and make the blue leaves really pop. Jump on over to Miss Beta's blog to see the rest of the photos! Today as part of the #bringbackthewhimsy campaign, I'll be giving you some tips for buying a genuine vintage whimsy. We'll look at what sort of hats count as whimsies, where to get them, search terms to use when looking online. So a whimsy is going to be primarily veiling and trims, with no hat foundation. 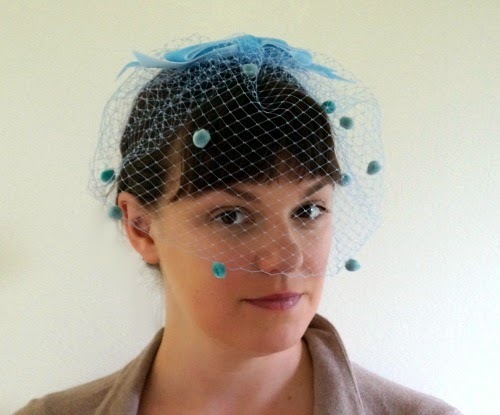 Ring hats can also be considered whimsies, and some other wire-foundation hats. I was happy to hear in the comments last time that people are finding whimsies at vintage and second-hand shops. That seems like the best option for being able to check out the condition yourself and possibly get a bargain too. I've been browsing them online for a while, mostly through Etsy and Ebay. 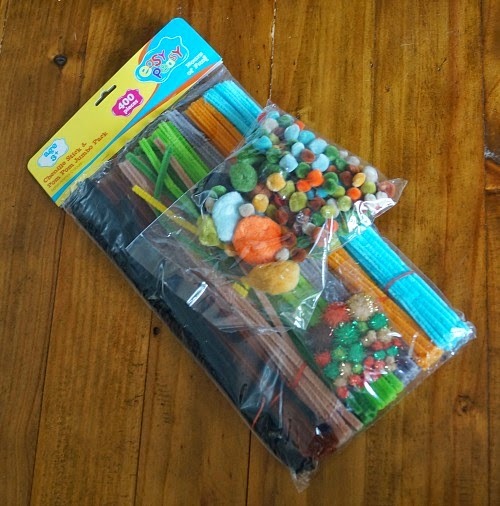 I have seen some "lots" of a few whimsies together, and these are usually great value. Sometimes the individual ones are getting up to a very high price for simple designs, so be cautious. There are, however, some really fancy ones that would be worth the price tag. I've also seen quite a few with original boxes, possibly unworn, which would give you a good chance of them being in excellent condition. I've got a list on Etsy for #bringbackthewhimsy, which has some great examples. Some of the items on there are sold already, but I've included them for inspiration purposes for those who want to make their own. I've also got a #bringbackthewhimsy Pinterest board, with more examples, including some pattern envelopes! 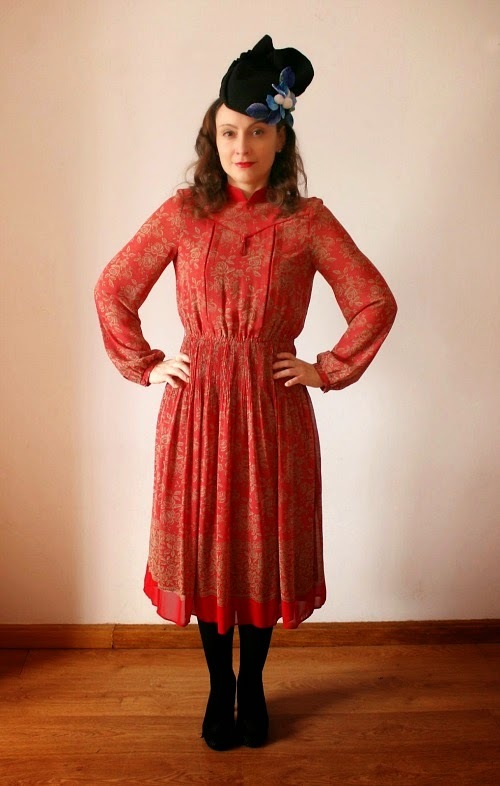 I think we all know how fraught with difficulty searching for vintage (or anything, really) online can be. Many sellers won't know that what they have is called a whimsy. Others won't know that what they have is NOT a whimsy. Plus, of course, the other meaning of whimsy comes up a lot, and you might get a lot of results that are just whimsical. I think it is often easier, if you have the time, to search for vintage hats and find the ones that are clearly whimsies. Adding 1960s and/or veil to the search helped narrow it down on Pinterest. 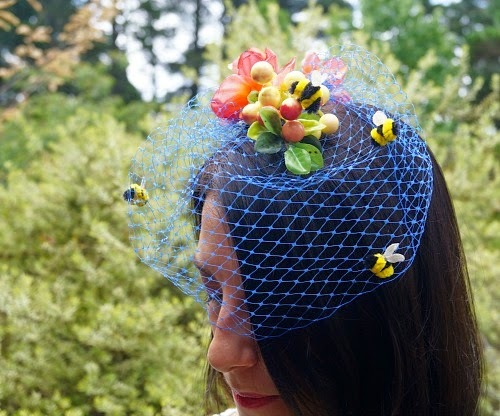 Other terms that might be helpful are "veil hat" (another proper term for whimsies), "ring hat" (if you like that style), veil, birdcage veil (a modern term but possibly used by sellers) and fascinator (likewise). I also had some luck searching using "whimsey". And I saw "snood" used a few times on whimsies! 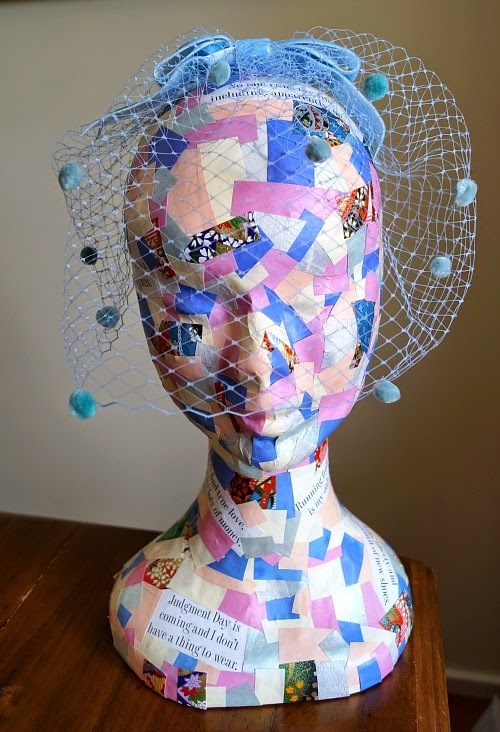 A word on modern handmade whimsies...I rarely look at the work of other milliners online, but I wanted to see what a search on Etsy for handmade whimsies would unearth. The results? 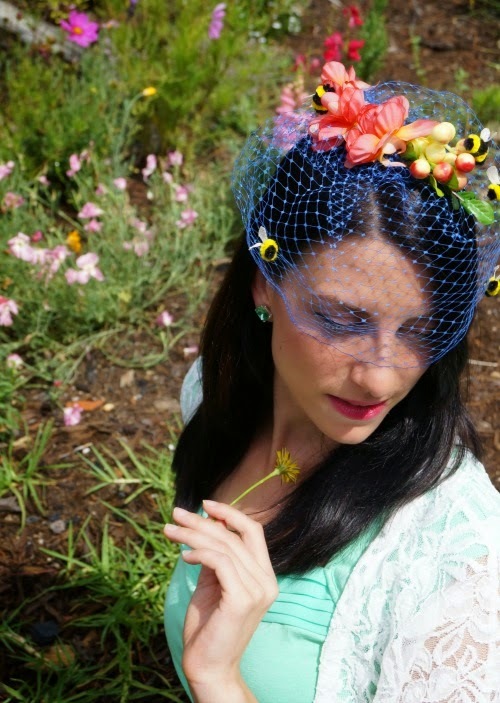 I found a few amazing handmade whimsies that are totally true to vintage style, a lot of floral headbands and modern fascinators that I think they were suggesting counted as whimsies, and a lot of hats that are apparently whimsical. Next time, guys, I'm going to do an actual tutorial on making your own whimsy. I'm aiming to make it flexible, so that you should be able to work with materials you are likely to already have, if you craft or sew at all. 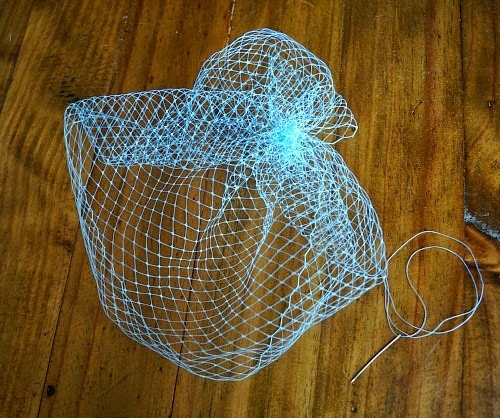 The main material you'll want to make sure you have is veiling. One book I have suggests one yard of length, but I don't find I need that much. We should be able to make something work with less. You will also want a hair comb, or some kind of clip. See you next week for the crafting! Today I'm launching one of my big projects for 2015, and I'm pretty excited about it. I hope you will be too, and will maybe join me. While researching vintage hats, and the 1960s in particular, I became familiar with the idea of a "whimsy". My grandmother, Wendy, first mentioned it when I asked her about her memories of hats in the 1960s. Since then I've seen plenty of vintage whimsies for sale online, and pictures in the Australian Women's Weekly while researching. Essentially, a whimsy is a veil with some kind of trim. It might be, at its most simple, a flower atop a gathered veil. More often, there are decorations on the veil itself - rhinestones, felt cut-out shapes, more small flowers, chenille dots, or feathers, for example. Flowers and bows seem to be the most popular "main" decoration at the top. Some styles with a bit more structure are also called whimsies by some people. They might have a small wire frame structure to hold the whimsy to the head, or the fabric-covered "rings" that sit around the head. Ultimately though, the veil is the main event on the hat, and it lacks a traditional crown or brim. My research shows the first hats that resemble whimsies appearing in the late 1950s, as in a few of the images in this 1950s millinery research post. They were, however, at their most popular in the 1960s. How cool are whimsies? Right? The correct answer is "Very cool, Tanith, now that you mention it." So my idea is that it's time we brought back the whimsy. 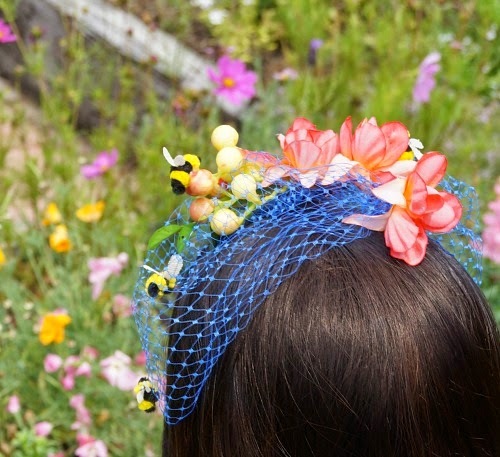 The word itself says it all; whimsies are about fun and silliness in your head wear. I'm sure we can all appreciate that and use a little more of it in our lives. I want you all to join me in having a go at wearing a whimsy, sharing the photos on social media with the hashtag #bringbackthewhimsy. 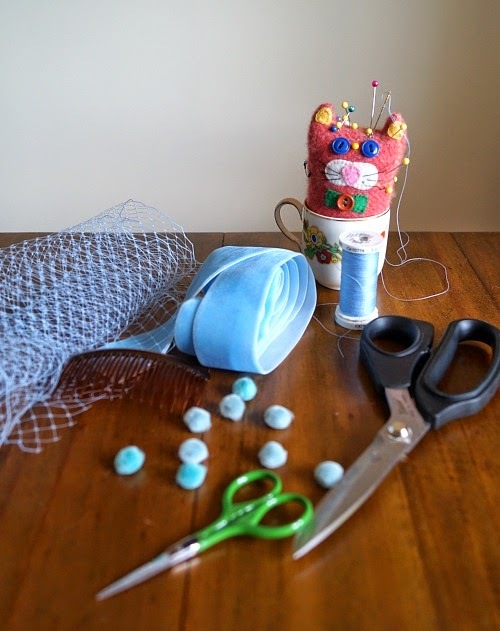 I know many of you won't already have a whimsy, but the cool thing is that they are both easy and cheap to buy, and also fairly easy to make if you have some basic sewing skills (and we're talking hand-sewing, here, and nothing fancy). I'm going to do future posts on both making and buying whimsies. Each month, I'm going to release a new whimsy design that will be available to order. This is the first design, for February, called simply "Bumblebee". I wanted to have a little fun project to work on as well as my other design collections, and this is it! You can order yourself your very own "Bumblebee" from my online store. Since genuine vintage whimsies are easy enough to find, I wanted my collection to be different and move beyond the simple styles traditionally found. And since I love fun themes, each one will explore a theme or idea. I became a bit obsessed with creating bees recently, so that had to be the first theme! I have a lot of fun ideas for the future, with inspiration from animals, plants, movies, colours, prints, foods, and more. Although I do have a lot of ideas, I'm also really keen to hear any suggestions you have? What theme would you like to see me explore? I hope you will join me in bringing back the whimsy!